Marketing Strategy Musings - Strategy Dude (Edmund Wong's blog): Why Don't Commuter Ferries Run Billboard Ads? Why Don't Commuter Ferries Run Billboard Ads? The other day I was riding on a Blue & Gold ferry boat across the bay in San Francisco. And I realized something - Why don't the ferry companies sell advertising on billboards in the boats? Sure, there are lots of windows that look out on the beautiful bay. But there's also wall space for ads. It seems like a perfect vehicle to market to commuters who ride it back and forth. That's a captive audience stuck on a boat for 30-45 minutes until the next stop. 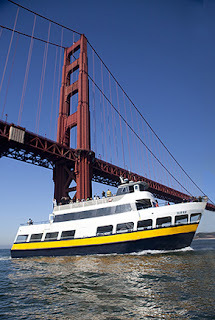 Operates the Tiburon ferry, the only unsubsidized commuter ferry service on the Bay.